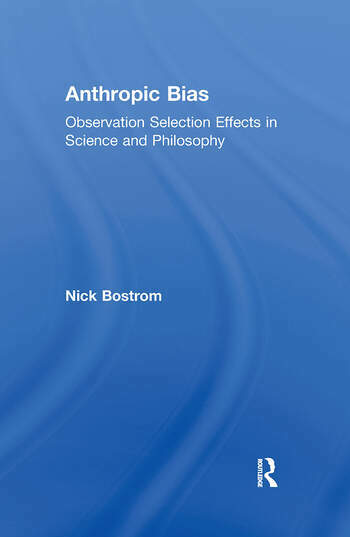 Anthropic Bias explores how to reason when you suspect that your evidence is biased by "observation selection effects"--that is, evidence that has been filtered by the precondition that there be some suitably positioned observer to "have" the evidence. This conundrum--sometimes alluded to as "the anthropic principle," "self-locating belief," or "indexical information"--turns out to be a surprisingly perplexing and intellectually stimulating challenge, one abounding with important implications for many areas in science and philosophy. And there are the applications in contemporary science: cosmology ("How many universes are there? ", "Why does the universe appear fine-tuned for life? "); evolutionary theory ("How improbable was the evolution of intelligent life on our planet? "); the problem of time's arrow ("Can it be given a thermodynamic explanation? "); quantum physics ("How can the many-worlds theory be tested? "); game-theory problems with imperfect recall ("How to model them? "); even traffic analysis ("Why is the 'next lane' faster? ").